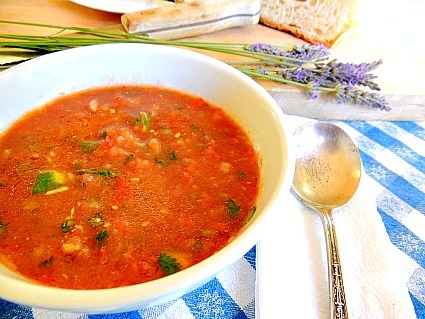 Gazpacho Recipe - this is a great recipe for low glycemic eating! This easy gazpacho recipe is another great recipe for the low glycemic plan...loaded with nutrients and fiber and very filling! You can add plain yogurt and slices of avocado to make it your complete meal. A key strategy to staying slim is to eat foods with lots of volume, the fibrous vegetables like the cucumber and peppers in gazpacho that take a long time to eat and are very satisfying. Gazpacho is a Spanish soup that has endless variations depending on what region of Spain is making it. There are some made with bread in it but this is not that version. Why add the dense carbohydrates when it’s delicious without it. You could add a big dollop of plain Greek yogurt if you wanted to add some protein and make it a complete meal. If you eat it at lunchtime have a slice of 100% whole grain bread or toast with it. You can make your gazpacho as thin or as thick as you want or as smooth or chunky. You do this by blending or processing a small bunch of ingredients at a time. Using a strong blender like a Vitamixer or your food processor, finely (or coarsely) chop cucumber and the peppers and remove to a bowl. Put onion and tomatoes in blender or food processor and chop to the texture you want. Coarsely cut the avocado and jalapeno and add with the finely chopped cilantro. Blend as thin or thick as you want it. You can always add a little water to thin it out. Now put all your ingredients in a large bowl and add the olive oil and seasonings and more water if you want. Put it all in a large container with a lid and refrigerate for at least an hour. Now you’re ready for your gazpacho lunch or first course. If your soup is the main attraction put the plain yogurt in a separate serving bowl. Garnish the soup bowls with a slice of avocado and serve. Gazpacho can be a side dish or the whole meal. Adding yogurt gives it more staying power. Because of the richness of the avocado it can be quite filling. If you eat it at night leave off the whole grain crackers or bread. Just have fruit for dessert. It’s often called a salad in a soup. There’s nothing like cold gazpacho on a sizzling hot summer day or evening. Return from Gazpacho Recipe to Low Glycemic Recipes. Return from Gazpacho Recipe to Lifetime Fat Loss home page.